﻿David grew up with a deep appreciation for nature and the outdoors and experienced its restorative and healing qualities from an early age. David is a licensed health psychologist and outcomes researcher in Northwestern University’s Department of Medical Social Sciences. One area of his research focuses on the health benefits of mindfulness meditation and yoga and their stress reducing and quality of life enhancing effects for people with cancer. He is honored to be able to do this and work with such amazing people. ﻿At TNT David is a Mindfulness Guide and also serves as Executive Director where he oversees all major aspects of TNT and its mission fulfillment. ﻿Gwen is a founding member and serves as our Program Director. She is a lifelong outdoor enthusiast and has completed two NOLS (National Outdoor Leadership School) Courses, one involving a twenty-eight night stay in the backcountry. She’s a certified Wilderness First Responder and a Leave No Trace Master Educator and has a Master’s degree in Recreation, Parks and Leisure Services Administration. Gwen does a lot of everything, from communicating with new applicants and alumni, setting up treks, sending out our promotional materials, launching fundraisers, helping participants with pay-it-forward pledges, leading treks as a wilderness guide, and attending medical and cancer survivor conferences. Up until recently, teens and young adults have really had to find us and we knew we could do better in our efforts to make life-long connections with cancer treatment centers and community support organizations so that we can also find teens and young adults to participate in our programs. There are hundreds of community-based cancer support organizations across the country that provide psycho-social support services to people with cancer and their caregivers. Gwen leads a targeted outreach initiative to map, track, identify and engage key contacts at every cancer treatment center and support organization for teens and young adults in the country to assure everyone is always aware about what we’re doing. ﻿Carly grew up in Kalispell, Montana where she spent much of her childhood hiking, camping and fishing in Glacier National Park. During college, she ran cross country at Northwestern University and got her MA in Counseling Psychology from Northwestern's Family Institute. Carly is one of our lead mindfulness and yoga guides on many of our treks and is Director of Social and Digital Media. She also works on several mindfulness and yoga-focused research studies in the Department of Medical Social Sciences at Northwestern University with Founder David Victorson. In her social media leadership position she helps develop strategy, campaigns, and oversees a small team of social and digital media “ambassadors”, many of whom are young adults with cancer. This has expanded our online voice across several social media platforms beyond Facebook and Twitter, and offers our alumni with meaningful ways to remain engaged in our organization following their treks. and quantify the long term impact of our programming on participants’ lives and provide supportive services well beyond their special time in nature. Kelley is an avid outdoors enthusiast and teaches mindfulness and yoga on treks. She is a licensed psychologist and Assistant Professor in the Department of Human Development and Family Studies at Colorado State University. 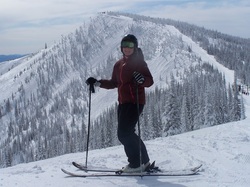 Lori is from Colorado where she grew up skiing, hiking, rafting, and biking. After teaching at a secondary Montessori school for six years in her home state, Lori packed up for Illinois where she received her graduate degree in social work from the University of Chicago. Since graduating in 2012, she has worked as a licensed clinical social worker at Lurie Children’s Hospital of Chicago, supporting children, adolescents, and young adults with brain tumor diagnoses. When she’s not at the hospital, Lori also practices and teaches yoga and meditation.